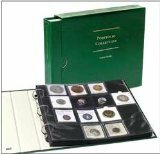 Coin Collection Albums and Folders are a good way for the beginner to organize and display a collection of circulated coins. They are available in a variety of materials, prices and levels of protection. There are several types of coin albums on the market including basic albums that have slots cut out to the size of the coin and others that have plastic slides that protect both sides of the coin. The empty slots let you see at a glance which coins you need to complete your collection. There are also coin albums with vinyl pages. Vinyl albums may leak PVC over time which can be damaging to your coins. Paper coin folders can eventually cause toning of your coins. Coin albums which have slides can leave slidemarks on your coins if the coins are not properly placed in them. Most coin albums are not recommended for long-term storage of coins. Most are only designed to be used for lower grade circulated coins. If you want to use coin albums for long term storage of more valuable coins, be sure that the albums you choose are designed for that purpose.